Garmin International Inc., a unit of Garmin Ltd. (NASDAQ:GRMN) , and Universal Partnerships & Licensing today announced a partnership for The Biggest Loser branded fitness devices beginning with the launch of The Biggest Loser v’ivofit daily activity tracker in early October 2014. All Biggest Loser contestants on the current season of the Shine America produced series will be wearing The Biggest Loser v’ivofit to set healthy goals, track their progress, and stay accountable to their trainers. The Biggest Loser v’ivofit will be highlighted during tonights episode at 8/7 p.m. CT on NBC. For more than a decade Garmin wearables have helped people reach health and wellness goals, and the introduction of v’ivofit earlier this year brought that motivation to the next level, said Dan Bartel, Garmins vice president of worldwide sales. We are very excited to partner with The Biggest Loser, one of the most popular shows on television, which shares our dedication and passion for helping create lifelong healthy habits. The Biggest Loser v’ivofit brings together two iconic lifestyle brands, said Cindy Chang, senior vice president of worldwide sales for Universal Partnerships & Licensing. 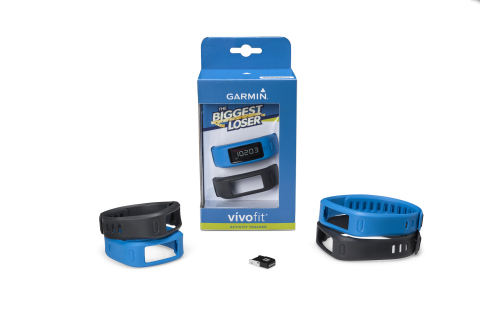 Garmin remains at the forefront in the wearable technology category, and this special Biggest Loser v’ivofit offers consumers the same motivational tools as the contestants on the show, allowing them to create their own healthy habits and meet fitness goals at home. The Biggest Loser v’ivofit is a stylish, lightweight daily activity tracker designed to turn good intentions into lifelong habits. V’ivofit is the only fitness band with over one year of battery life and a unique curved display that always stays on. The Biggest Loser v’ivofit automatically greets users with a personalized daily goal, tracks their progress and reminds them when its time to move. It shows steps, goal countdown, calories, distance, and time of day, and has a 5ATM water rating1. The Biggest Loser v’ivofit is also compatible with ANT+ heart rate monitors for fitness activities. Users can wirelessly sync their Biggest Loser v’ivofit with Garmin Connect, a free online fitness community with millions of users, or on their compatible mobile device2 with the Garmin Connect Mobile app to see a complete picture of their daily and overall progress, join online challenges with other The Biggest Loser v’ivofit users or start their own competitions with friends for virtual badges and added motivation. The Biggest Loser v’ivofit was designed to remove barriers to establishing healthy habits and will be used as a constant motivator and activity tracker both on the ranch and after The Biggest Loser contestants leave to continue competing at home. The Biggest Loser v’ivofit with a variety of interchangeable bands will be available at NBCUniversals online store and various U.S. Retailers. 1 Water rating 5 ATM (50m). For more information, see Garmin.com/waterrating. Garmin and v’ivofit are registered trademarks, and Garmin Connect and ANT+ are trademarks of Garmin Ltd. or its subsidiaries. (c) 2014 NBC Studios & Reveille LLC; The Biggest Loser is a trademark of Reveille LLC and its related entities, and is used under license. All rights reserved. The Biggest Loser is licensed by Universal Partnerships & Licensing in association with Shine America, the producers of The Biggest Loser. Big Tent Entertainment is the licensing agent of record for The Biggest Loser. Universal Partnerships & Licensing (UP&L) oversees NBCUniversals consumer product licensing, film, home entertainment and television promotions, and corporate alliances for Universals theatrical, home entertainment, television, theme parks and stage productions. This dedicated division is also responsible for monetizing the companys vast library of films and characters through licensing, branding and marketing opportunities. UP&L is part of NBCUniversal. NBCUniversal is one of the worlds leading media and entertainment companies in the development, production, and marketing of entertainment, news, and information to a global audience. NBCUniversal owns and operates a valuable portfolio of news and entertainment television networks, a premier motion picture company, significant television production operations, a leading television stations group, world-renowned theme parks, and a suite of leading Internet-based businesses. NBCUniversal is a subsidiary of Comcast Corporation. Shine America is the U.S. division of Shine Group, an award-winning global production and distribution organization with 27 production companies across 11 countries. Shine America is a leading television studio that creates inspired and compelling programming including current unscripted series MasterChef (FOX), MasterChef Junior (FOX), The Biggest Loser (NBC), Minute to Win It (GSN), The Face (Oxygen), Restaurant Startup (CNBC) and Fake Off (TruTV). Scripted series include Peabody Award-winning The Bridge (FX), as well as upcoming dramas Gracepoint (FOX) and Utopia (HBO). Shine America incorporates several divisions including unscripted format label Ardaban, which develops and distributes original content to the U.S. marketplace. The global Shine 360 division builds brands through the leveraging of its intellectual property and creating integrated marketing opportunities for advertisers. Shine Groups distribution arm, Shine International, distributes Shine Americas extensive library of programming and formats to more than 150 countries. Big Tent Entertainment, LLC (www.bigtent.tv) is an entertainment company specializing in the integrated development and management of media brands. Formed in 2002, the company manages a portfolio across both traditional and new media while focusing on brand strategy, community building, viral marketing, licensing and retail merchandising. The company represents NBCUniversals Biggest Loser franchise, 24-hour preschool network Sprout, the viral sensation Domo (Worldwide ex. Asia), Discovery Kids from Discovery Communications, Miffy in North America, as well as global personalization brand Pixfusion. This release includes forward-looking statements regarding Garmin Ltd. and its business. Such statements are based on managements current expectations. The forward-looking events and circumstances discussed in this release may not occur and actual results could differ materially as a result of known and unknown risk factors and uncertainties affecting Garmin, including, but not limited to, the risk factors listed in the Annual Report on Form 10-K for the year ended December 28, 2013, filed by Garmin with the Securities and Exchange Commission (Commission file number 0-31983). A copy of such Form 10-K is available at http://www.garmin.com/aboutGarmin/invRelations/finReports.html. No forward-looking statement can be guaranteed. Forward-looking statements speak only as of the date on which they are made and Garmin undertakes no obligation to publicly update or revise any forward-looking statement, whether as a result of new information, future events, or otherwise. The v’ivofit has not been authorized as required by the rules of the Federal Communications Commission. These devices are not, and may not be, offered for sale or lease, or sold or leased, until authorization is obtained.